Located just on the far side of the Clackamas River off HWY 99E/ McLoughlin Boulevard, Clackamette Park celebrates the union of the Clackamas and Willamette Rivers just within the nearby town of Oregon City (~25 min drive from downtown PDX). 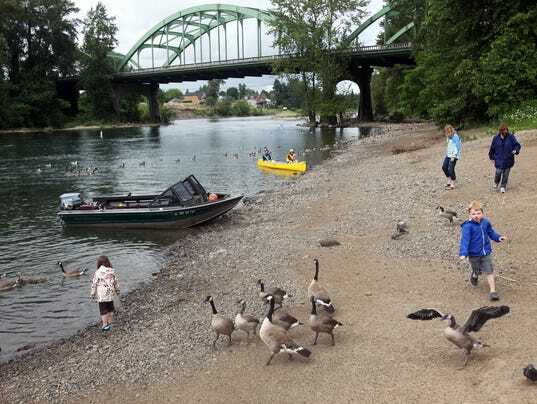 If the weather is cool and pleasant we’ll walk a three mile loop featuring two Clackamas River bridges, three parks and the infamous historic “Pow Wow Tree” in the joining neighborhood. Most of this walk will be on well-groomed wide trails in the wild greenspace. The adjacent area is undergoing development into a posh cove-side community, so currently features an interesting array of large construction machines. This area has haunting industrial remnants as well as the wild natural beauty inherent in these two rivers. View busy and deadly High Rocks Park from the pedestrian bridge. If the weather is hot we will forgo heat exhaustion in favor of a nice swim instead in man-made Clackamette Cove, just up the frontage road from the Clackamette Park entrance. These still lagoon waters are neither advertised nor signed and therefore retain obscurity despite being arguably the best warm swimming hole in the greater Portland area. Try it before it gets developed and discovered by the masses. Bring swimsuit, towel, water, snacks, walking shoes, and if swimming definitely water shoes/flip flops, as the lake also has an evident industrial past. All swimming skill levels are welcome, but there is no official life guard. Bring a floaty/water wings or challenge yourself to conquer the triathlon buoys scattered around the lake. Friendly dogs and families are welcome. Contact Organizer Dr. Mindy Curry for more information. Meet/park near the restrooms located straight in towards the boat ramp and to the left from the Clackamette Park entrance. From 99E cross the bridge across the Clackamas River into Oregon City, then take a right on the first street just past McDonalds across from the strip mall. Take the first right, then turn left into Clackamette Park.